what fuels my creative fires and keeps me going! A long time member of the Eco Fashion World family, Stephanie Gale of Beau Monde Organics was recently featured by Urban Times, discussing how she wound up designing the fabulous Beau Monde Organics cotton voile scarves and her newest project…iPhone covers. Gale is a constant source of positive inspiration and it shines through in her beautiful product line. As a direct descendant to a master tailor of New York’s garment district (her grandfather) and as an extremely talented artist in her own right, Gale’s path to designing and creating was an organic one. Her love of the earth and her desire to create positive change through her work have melded perfectly into her business plan of action. 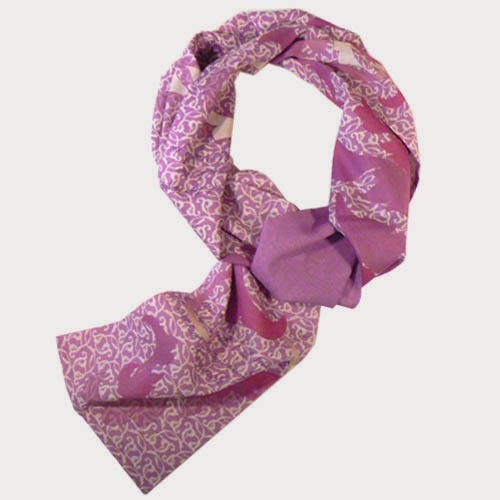 Gale’s scarves are recognizable – the artistic style is distinct, as well as the luxurious quality. As that part of the business grows, Gale is constantly open to new and additional projects to integrate into Beau Monde Organics. 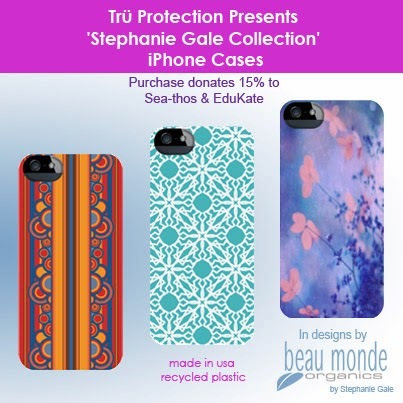 Most recently, she has partnered with Tru Protection to design iPhone covers. portion of the iPhone cover sales is given to Sea Thos or Edukate. Gale maintains a particularly positive and energetic outlook on life every day. This is unmistakably part of her recipe for success. Because part of growing and changing is in sharing and learning from each other, we asked Gale to share some of her hopes for the new year as well as hints of what inspires and motivates her. EFW: What is your hope or a ‘main goal’ for this New Year? SG: "When one tugs at a single thing in Nature, he finds it attached to the rest of the world," is our Mission’s theme. I'd like to engender more understanding of the deeply profound truth in this quote of John Muir. Give people the truth of all the ways we are connected to our earth, and teach about how every action has consequences, for good or for bad. It's important to care, and then take action on what you care about. When people are informed, they lose their fears and become empowered to make choices towards a healthy and sustainable future. They can then help avoid the devastation of our beautiful and wondrous planet. In this way, my hope is to help more people to live a more 'connected' life, and to help them 'Live Beautifully'. EFW: What keeps you so positive and inspired on a daily basis? SG: "To be positive in the face of difficulty and challenge - that is a choice, and an intention. I'm a bit of a quote junkie and definitely a new-music junkie! I love (ok, need) to have a constant source of both, and the beauty and power of music and words help me to keep my attitude on track. (for examples, see my blog's ‘Fav Quote Friday' posts and my 'Positivity' board on Pinterest. As far as daily inspiration, there is much energy in being creative, and I always see beauty and inspiration everywhere I go, from many sources; nature, people, lifestyle, world cultures and all of 'The Arts'. But there are energy sources: the first is that I love what I do and am truly passionate about my company and its Mission. The other is the real 'secret weapon'; the support and encouragement I receive of my beautiful friends and family, which I could not do without. And the delight and appreciation of my lovely customers, who let me know that what I do makes them happy and feel beautiful. That's a lot of tinder for my creative fire, and I couldn't be more grateful. Hope you enjoyed this interview and knowing some of my 'secrets'. Let me know what 'secret weapons' you use to keep living beautifully!